The tiny house trend is sweeping the nation. In a world where we've amassed an unprecedented amount of clutter, these miniature dwellings are very tempting if you can handle transitioning to a small space. Can you imagine living in a tiny house, surrounded by beautiful rolling hills and the incredible splendor of the outdoors? Who needs an enormous mansion when you can cut loose from everything that is tying you down, simplify and become one with nature? As long as you have an actual living space and small living room to unwind you pretty much have everything you need. Tiny living could be right for you. These houses are basically the grown-up version of having a fort in your backyard, and some are actually in backyards. 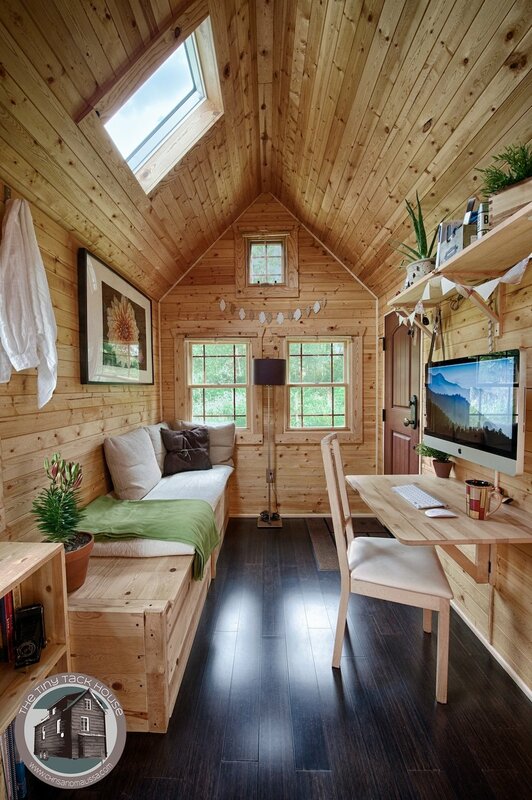 Check out these 16 amazing tiny house plans to get some inspiration! This 140-square-foot home was built by Christopher and Malissa Tack of Snohomish, Washington. Built on a flat-bed trailer, the home is eco-friendly and sustainable, using natural wool as insulation, and utilizing solar panels for energy. There's plenty of counter space in the tiny home interior so that you're able to function in the space. The Tacks even grow their own vegetables in a tiny garden right next to their small house. Okay, so it's not technically a house, but you know you still want to live in this shabby chic bungalow with tons of natural light. Interior design blogger Sandy Foster works out of this magical 125-square-foot studio in the Catskills of New York. The tiny studio boasts an old-fashioned wood-burning stove and a sleeping loft that Foster is constantly changing up to reflect French and Nordic style. Just outside of Portland, Oregon on five acres of land resides interior designer Jessica Helgerson and her family in a comparatively palatial 540 square feet. They take advantage of their space to get a solid kitchen countertop. That wood stove adds a nice touch as well and is small enough to complement the space. Jessica and her husband Yianni bought the home in 2008 and remodeled it using repurposed materials. Here's one you can stay in if you're coming to Austin anytime soon! Located east of I-H 35 in the heart of downtown Austin, this California cool space goes for $125 a night on Airbnb. Considering that median hotel room pricing in downtown Austin will run you anywhere from $200-$600 per night, this place is a steal! This tiny dwelling was built over a dead garden patch in the backyard of certified sustainable building advisor Megan Lea. 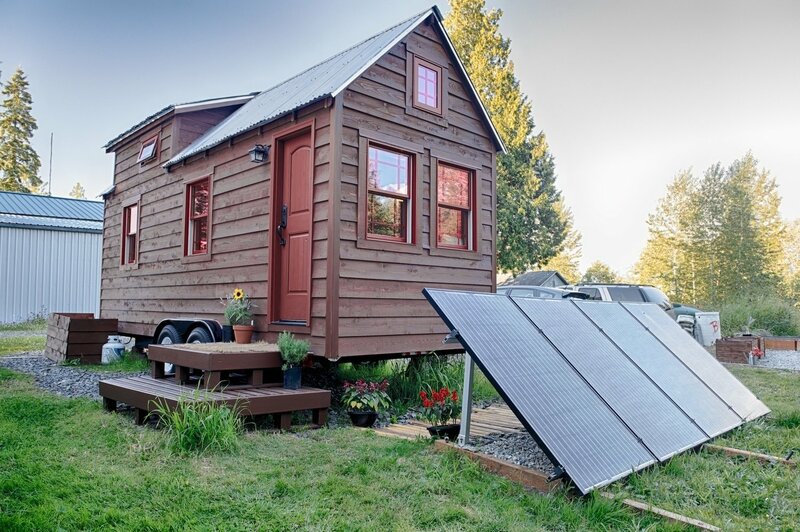 Vina's tiny house has 140 square feet of self-sustainability. It boasts a fireplace, skylights and a deck out front. Unlike most tiny houses, this little cabin in the woods has the bed on the bottom and looks larger than it is, due to the pleasant deck out front. To look at the simple exterior of this tiny house/studio, you'd never realize the interior is richly decorated with such intricate walnut-veneer paneling and architectural detail. Created by Pickell Architecture in 2012, the two-room bungalow sits atop a convenient garage. Just in case you thought living in a tiny house means sacrificing luxury, think again. The Tinywood Two, built by Tinywood Homes has a hot tub that fits right on the flatbed. This UK company developed hot tubs specifically for tiny homes. At 131 square feet, this house is just short of tiny, which is why it's called "wee" (which is also, somehow, much cuter). No space is wasted in this small abode, but if you're looking for a more spacious wee house, they also make a two-bedroom option. 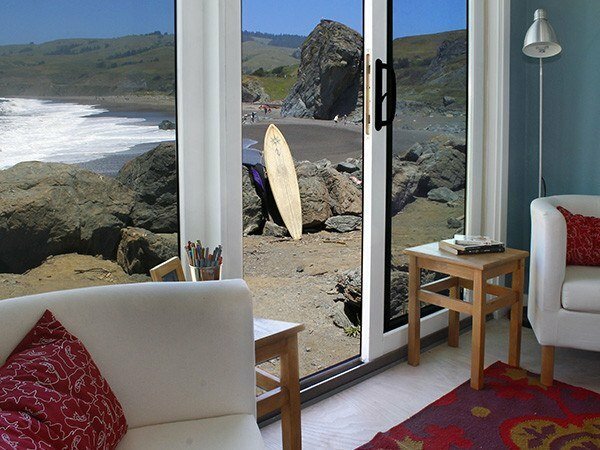 The Wee House Company is also located in the UK, in case you're looking for a tiny home abroad. This tiny home by Tumbleweed Tiny House Company may be just what you need if you want to unwind and simplify your life. At 172 square feet with no loft, it's just enough room for one or cozy enough for two. This 14-foot by 14-foot outdoorsman's dream cabin is owned by prominent New York designer Scott Newkirk. It is totally off the grid, and Newkirk spends a few weeks there every summer to unwind from the stress of the city. Among tiny homes, the mini home is actually rather large. This adorable little house belongs to Akua and Brendon, a Canadian couple who have recently rented out their little 500-square-foot love nest for an extended stay in Thailand. Happy trails, friends! This enchantingly quirky home on wheels was built in 2006 as a vehicle through which to explore the Burning Man music festival. It was built using recycled and repurposed elements and combines pieces of old steam engines as well as steamships. The steam-punk themed vehicle is even available for rent! The Gruene Homestead Inn in Gruene, Texas (that's pronounced "green") on the outskirts of New Braunfels offers a really one-of-a-kind accommodation, namely, a restored grain silo. The loft space is available to rent for $175 per night and sleeps up to two adults and two children. The aptly named Music City Tiny House was built by Tennessee Tiny Homes in the city of Nashville, obviously. Originally built as a personal home, the Music City Tiny House quickly gained momentum in the constant zoning battle of the tiny house movement. It is also available to rent via Airbnb.